The Moody Blues are a band that history should have swept aside, a group forever left in the margins of the Big Book of Rock History, but their sheer gall and audacity made them endure in ways that most people never thought possible. When looking back at the Moody Blues from a strictly historical perspective, one thing becomes immediately clear: it's astonishing that the band even existed at all. 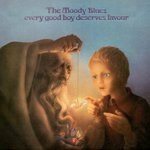 By all means, the Moody Blues are a band that history should have swept aside, a group that would be forever relegated to One Hit Wonder status and left in the margins of the Big Book of Rock History, but their sheer gall and audacity made them endure in ways that most people never even thought possible. After all, it was in 1964 that this small time R&B combo scored a UK #1 with "Go Now", a cover of a song by an obscure singer named Bessie Banks. At the time, the Moodys didn't even have their most famous lineup. The band consisted of Mike Pinder, Ray Thomas, Graeme Edge, Denny Laine, and Clint Warwick -- the latter two of which wouldn't even be with the group two years following "Go Now" and its stream of unsuccessful follow-ups. 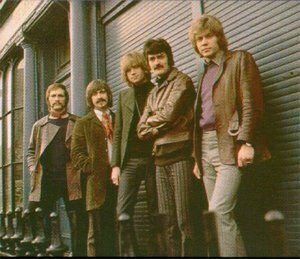 With the addition of both John Lodge and Justin Hayward in 1966, the group suddenly found a dynamic that was comfortable, daring, and ambitious all at the same time. Though Pinder and Thomas were hacking away at songs for years, it was Hayward who proved to be golden touch -- a songwriter with a gift for radio-friendly melodies that were as lavish as they were accessible. All five members were formidable songwriters, but, really, their label didn't care. Decca Records -- quite famously -- had the band on a short leash, as multiple singles and albums failed to live up to sales expectations, leaving the band with a heavy amount of debt. Downgraded from headliners to session musicians, Decca felt that they could use this very melody-heavy group for a bit of a gimmick: they would bring the joys of surround sound to Britain. Commissioned to record a stereophonic "rock" version of Dvorak's New World Symphony , the band was given a top-notch producer (Tony Clarke), a full orchestra, and -- most critically -- conductor/arranger Peter Knight. Though initial sessions went admirably, the Moodys just couldn't muster the enthusiasm needed to finish the project. Still, with an orchestra on hand (and with Knight's colorful gift for arranging), the band were able to convince Clarke to record some of the group's own songs. Though Decca was initially appalled that the band would be brash enough to hijack their pet project, they let it go through, and the result was Days of Future Passed, one of the most unlikely bestsellers in all of rock history. 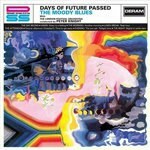 Now, 40 years down the line, we are receiving re-pumped and repackaged versions of the Moody Blues' "seminal albums", starting with 1967's Days of Future Passed and spanning to 1972's Seventh Sojourn. Over the course of these seven remastered discs, we hear the sound of a band willing to push the very notion of what "theatricality" is in a pop-rock context, starting out grand before settling into something of a routine. 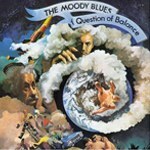 Though bolstered by some excellent bonus tracks (b-sides and radio sessions proving to be the best of the bunch), an album-by-album look at the group's seminal years yields more questions than answers, with highlights mixed throughout a series of songs that sound great by themselves, but far too similar when bunched together side-by-side. Days of Future Passed still remains the group's calling card, and for good reason. This disc emerged in 1967, right as the Beatles were conquering the audio-junkie realm with a little disc called Sgt. Peppers' Lonely Hearts Club Band. Sparking a sudden interest in stereo records, the timing of Future Passed (a title decided by the record label, of all things) was impeccable. 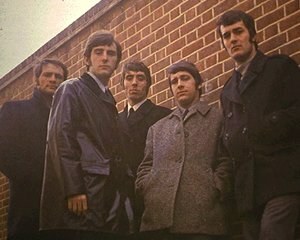 Though the group's songs melded a whole variety of English pop and folk styles (just listen to how "The Morning: Another Morning" begins almost as a RenFaire chorus before turning into something resembling a Broadway showtune), Knight's lavish orchestral interludes are what ultimately tied the disc together, giving strength to both the thematic and melodic cohesion of the disc. Sure, there were moments of unabashed pop ("Lunch Break: Peak Hour"), but, really, few songs would come to define the band more than Hayward's own composition, "Nights in White Satin". Once again assisted by Knight, "Nights in White Satin" wound up becoming a ballad as omnipresent as it was innocuous, the radio versions often leaving out the closing spoken word epilogue, as it didn't really make sense unless you heard the entire album (all while running dangerously close to pretension, a juggling act the group would impose on themselves from this album onward). Really, the Moodys didn't do anything groundbreaking or revolutionary with Days of Future Passed -- they just happened to release the right disc at the right time. They had a hit song, a hit album, and soon they were making radio and festival appearances just about everywhere (some of which are included on this '08 reissue, the best moment being a spry cover of "Don't Let Me Be Misunderstood" recorded for BBC Radio). Yet, as first-time fans came to realize, the band didn't take their orchestra with them, making it very hard to recreate some of the album's best moment in a live setting. Though Decca was pleased with the surprise success of Days of Future Passed, they weren't about to spring for another orchestra to do the band's bidding. As a result, the band began shying away from deliberately complex suites, focusing instead on songs that could be recreated in a live context. Knight was given the boot, and, to a sad degree, the band's most adventurous tendencies went with him. The lack of an orchestra suddenly gave renewed focus to keyboardist Mike Pinder, who had just discovered a new instrument called the Mellotron. Really, the Mellotron would be used to recreate as many string parts as possible, but it also gave Pinder a bit more leeway as a songwriter, even if he didn't really wind up blossoming as one until a few albums later. 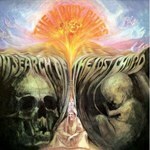 With 1968's In Search of the Lost Chord, the band began relying on vocal harmonies a lot more, all while refocusing their sound around what their guitars could do. Opening track "Ride My See-Saw" was just as joyous as any moment on Days of Future Passed, but removed from a thematic context, the band's songs began to show their limits. In retrospect, there really aren't all that many standout moments on Lost Chord, which makes the sudden appearance of "Legend of a Mind" a surprising and welcome relief. "Legend" begins with the famous line "Timothy Leary's dead...", a song that was never intended as a direct tribute to the LSD maestro, but, really, it would be hard to tell that to the hundreds of drug-addled fans that were caught up in the weed-worthy trips that the Moodys provided on Future Passed. Somewhat against their wishes, the Moodys were becoming known as a "drug band", a group whose lavish LPs were a safe haven for the late-night pot smoker. Unintentional icons during the tail end of the Flower Power era, the band would eventually rebel against this image -- most notably with the 1973 single "I'm Just a Singer (In a Rock and Roll Band)" -- but for the time being had to sit back and idly accept it as they began racking up sales and charting singles in the wake of Future Passed (though why excellent songs like "The Actor" were never given single consideration still remains something of a mystery). 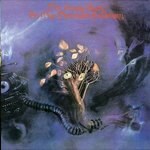 Now focusing more on studio compositions and less on touring, 1969 brought forth not one but two albums from the Moody Blues: On the Threshold of a Dream and the laboriously-titled To Our Children's Children's Children. Both of these discs attempt half-hearted concepts in the vein of Future Passed, but it's Threshold that comes off as the creative rebirth the guys needed in the wake of Lost Chord. Though Threshold opens with an innocuous pop ditty like Lost Chord did, "Lovely to See You" feels lose and lively in a way that Chord never did. The jazzy lament "Dear Diary", the first great Pinder composition "So Deep Within You" (half Bond theme and half Vegas show opener), and another fantastic Hayward composition in "Are You Sitting Comfortably" all add up to the best disc the group had put out since Future Passed, even if the closing "Voyage" suite feels a bit excessive. 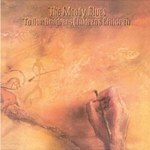 To Our Children's Children's Children starts off as promising with the fiery "Higher and Higher"... at least until voices come in and begin to describe some of the most absurd concepts this side of "I Am the Walrus", or any other latter-day Lennon composition ("the power of ten billion butterfly sneezes"? Really?). Perhaps collapsing under the pressure of putting out a second album during the same year-length period, the joyous moments like "Floating" feel undeniably forced, while the effective ones are cut all too short, as when Hayward's acoustic lament "I'd Never Thought I'd Love to Be a Hundred" clocks in at 65 seconds and leaves us pleading for more. Too often, this album feels like a desperate grab for relevance, as the sitars on "Sun Is Still Shining" feel like they've been tossed in just for the hell of it, much as how the tacked on Hayward/Thomas single "Watching and Waiting" flat-out lacks the boldness of earlier triumphs. 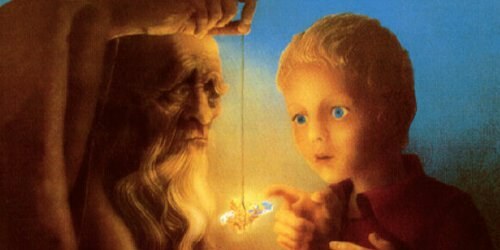 ...which is what makes 1971's Every Good Boy Deserves Favour such an unexpected delight. Lead-off pep single "The Story in Your Eyes" -- much like "Ride My See-Saw" only a few years earlier -- is uptempo without feeling too calculated, much as how the gentle ballad "Emily's Song" (a tribute to John Lodge's daughter) works simply by not being too sorrowful or indulgent. In fact, the wiry guitar solos at the end of "After You Came" reveal the band actually having fun, something that hadn't radiated from the Moody Blues camp for some time. Though it may not hold the same gravitas as Future Passed, the shared spirit of camaraderie shines through both on this and on Seventh Sojourn -- the last album they would release in this "classic era" lineup. Though essentially a continuation on the sound and vibe that drove Favour, Seventh Sojourn proved to be a fitting if somewhat unspectacular swan song for the band. 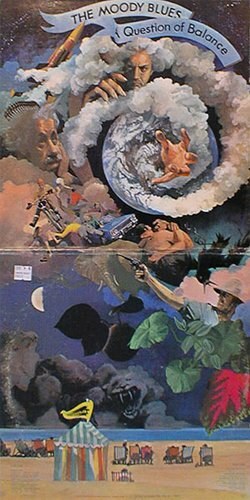 The singles (the prog-affected "Isn't Life Strange" and "I'm Just a Singer...") were strong, the album tracks were genuinely pleasant ("You and Me", despite being yet another anti-Vietnam tune, at least outpaces "Question" in terms of sheer enjoyability), and even the filler (the opening trio of songs) is at least passable and not grating. It may not have been the group's crowning achievement, but it was still a worthy cause for celebration, all while masking the great battle of egos that was happening behind the scenes, forcing the group to splinter shortly after this album's release. 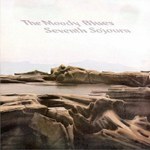 Years later, the band would remain a great concert draw, and they would even pen strong hits in the '80s ("Gemini Dream", "In Your Wildest Dreams", really anything with "dream" in the title), but it was these seven albums that would ultimately come to define the Moody Blues' legacy on pop music. They never were the most innovative group, but they didn't need to be. They found a niche style and played into it very well (and, at times, too well). There's an episode of The Simpsons in which Homer and Ned Flanders go to Vegas, passing by a hotel marquee which reads "TONIGHT: The Satin Knights Play the Moody Blues -- OPENING ACT: The Moody Blues". It's a very conscious jibe at the band (who lent their voices to the episode), but it also was a wry note of how the group had become something of a parody of themselves. That said, few parodies have ever produced such a wealth of enduring music over such a finite span of time -- a claim that very, very few bands can lay claim to.